Last updated July 29, 2016. All 110 seats in the Michigan House of Representatives will be up for election in November. Republicans won a 63-47 majority in 2014, up from 59-41 after 2012. There are 42 open seats, 27 held by Republicans and 15 held by democrats. 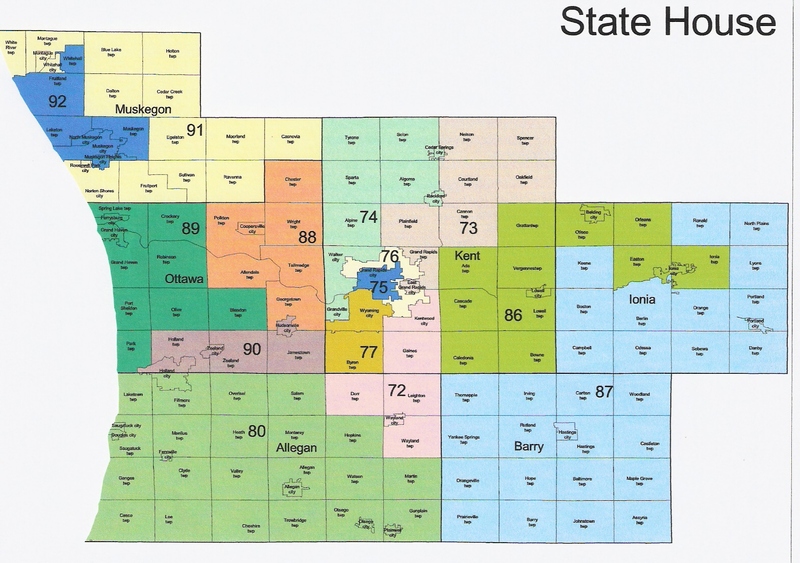 There are 41 open due to term-limits and 1 (Gretchen Driskell) just seeking another office. Republicans picked up four seats (62, 71, 84, 91) in 2014. Democrats are hoping to take back the state house. They will benefit from higher turnout in a presidential year and possibly coattails from the presidential race. They will try to take advantage of Republican support for a tax increase for roads and Governor Snyder’s handling of the Flint water crisis, though state house candidates had nothing to do with the latter. There are also many Republican seats first won in 2010 that are now term-limited. Republicans may benefit from the recent elimination of straight ticket voting. There are a number of interesting primaries in August. 2014 saw a number of primaries between establishment and Tea Party/antiestablishment conservatives. 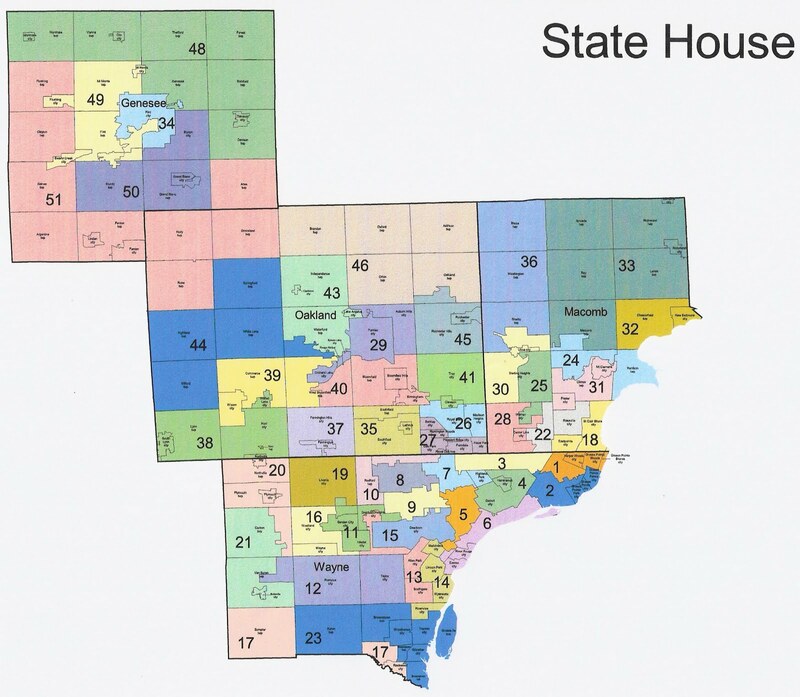 While the establishment won the majority of them, the antiestablishment won enough that the relatively conservative faction of the state house won the leadership races. The state house has served as a check on some of the Governor’s less conservative plans. 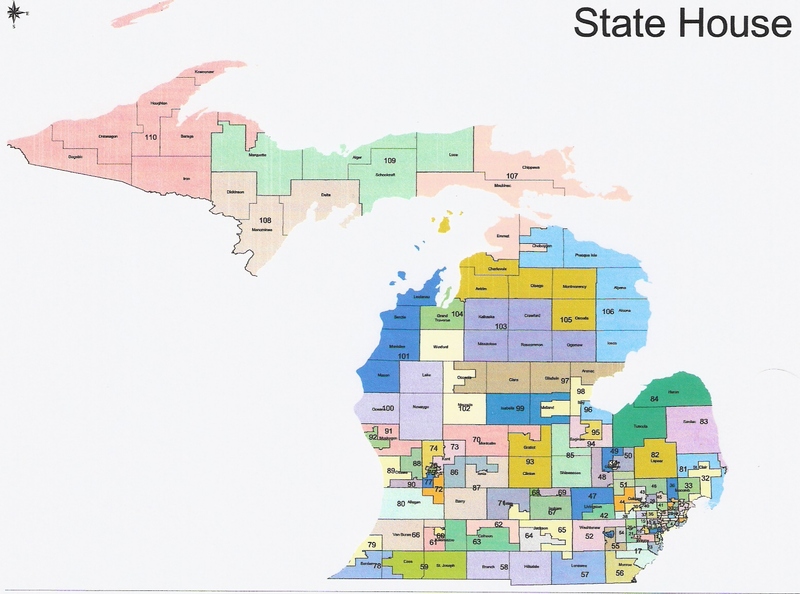 This year, there are contests between relatively conservative candidates backed by the state house establishment, more moderate establishment candidates, and some antiestablishment conservatives supported by various Tea Parties and the Michigan Prosperity Project. Most primary battles are in open seats, but there are a few primary challenges to incumbents worth watching. The following lists district number, current incumbent, geographic description, 2012 and 2014 state house results, 2012 Romney %, and political rating. I did not use ‘likely’ in the general election ratings. Candidates are labeled as establishment (E), conservative (C), Tea Party (T), and antiestablishment conservative (AC), when these labels clearly apply. Candidates solely endorsed by Michigan Right to Life (RTL) are also noted. (D) Brian Banks won the 2012 primary before his long criminal record and ethical issues were exposed. He won a 2014 primary against divided opposition. This year, he again faces divided opposition and also new felony charges. (D) This seat is open after Julie Plawecki’s sudden death. There will be a special primary August 30. Party insiders picked Inkster Councilman Jewell Jones for the full term. (R) (Lean Nielson) Attorney Jeffrey Neilson, pastor Jeff Noble (AC), and Northville Township Trustee Chris Roosen are running. Pat Somerville won three close victories in this seat, which is the top D target. (R) (Likely Howey) Trenton Councilman Bob Howey (E/RTL) faces Michael Frazier and Mike Taylor. (D) Township Clerk Sherry Berecz, Parks commissioner Darin Calmilleri, Trenton councilmember Steve Rzeppa, and Elayne Petrucci are running. (R) (Likely Marino) Macomb County Commissioner Steve Marino (E/RTL), Arzo Smith, and Darrel Smith are running. (R) (Likely Farrington) Diana Farrington (E), wife of the incumbent, faces Joseph Bogdan, Jackie Ryan, and Michael Shallal. (R) (Lean Hornberger) School board treasurer Pamela Hornberger (E), Michael Schmina, and Justin Tranchita are running. (R) (Tossup) city councilman Jeff Yaroch, Mel Koch, Colleen Carl (C) daughter of late state senator Douglas Carl (1986-1997), Julianne Cusumano, Chales Karafa, and Steven Stoll are running. (R) (Tossup) Bradford Jacobsen narrowly beat back a primary challenge 54-46 from John Reilly in 2014. This time, Reilly (AC) faces Joe Kent (E). (D) Road commissioner Barb Fuller and school board treasurer Donna Lasinski are running. (R) Senior center director Bronna Khale (E/RTL), Jim Cottrell, and Brian Good are running. Iden, who hurt himself by lying about a DUI in 2014, faces a rematch with liberal pastor John Fisher. Dr. Bizon faces Calhoun County Commissioner Jim Haadsma in this dem-leaning district. (R) (Lean Alexander) Jackson County Commissioner Julie Alexander, John Griffin, brother of the last D to hold this seat, and car dealer Phil Tripp are running. (R) (Likely Griffin) Van Buren County Commissioner Beth Griffin (E/T/RTL) faces Greg Kolich and veteran Matthew Nilson. (R) (Lean Lower) Former county commissioner James Lower (E), Alexander Gregory, Charles Mulholland, Jeremy Putansu, Dale Reyburn, and Michael Van Kleeck are running. (R) (Tossup) Teacher Ryan Gallogly, restaurateur Tony Noto, Bill Hirsch, Steven Johnson, and Robert Coughlin are running. (R) (Safe Brann) Restaurant owner Tommy Brann (E/C) faces Frank Murin. (R) (Tossup) Realtor Ryan Arnt, teacher Kim LaSata, wife of former rep (1998-2004) Charles LaSata, Mary Brown, and Troy Rolling are running. (R) (Likely Whiteford) Mary Whiteford won a special election in March 2016 to replace expelled rep. Cindy Gamrat. She faces a primary against Abigail Nobel (C/T) this time. (R) (Tossup) Sanilac County Commissioner Justin Faber, conservative activist Shane Hernandez (C/T), and Matt Muxlow (son of the incumbent) are running. (R) (Likely Frederick) Owosso Mayor Ben Frederick (C/E) faces Shiawassee County Commissioner Hartmann Aue. Robert Cotrell, and George Sode are also running. (R) (Tossup) Marine Thomas Albert, attorney Katherine Henry (C), Jeffrey Johnson, and Bartholomew Lower are running. (R) Ionia County Commissioner Julie Calley, wife of LG Brian Calley, is unopposed in the primary. (R) (Likely Lilly) Banker Jim Lilly (E/RTL) is the favorite over blogger Brandon Hall (AC), and Tracy Stille-Mulligan. (D) Principal Brian DuFresne, former county commissioner Brian Elder, and county commissioner Donald Tilley are running. (R) (Lean Wentworth) Veteran Jason Wentworth, George Gilmore, Brian Johnson, Jacob Link, and Thomas Winarski are running. (R) (Lean Hauck) Township Trustee Roger Hauck and realtor Robin Stressman are running. (D) Bryan Mielke is running again after coming close in 2014. (R) (Likely VanSingel) Accountant/businessman Scott VanSingel (C/E), John Wilterink and Dan Eley are running. (R) (Likely VanderWall) Mason county commissioner Curt VanderWall, Mark Walter, and Cary Urka are running. (R) (Tossup) Veteran Jason Briscoe, Manton Mayor Michelle Hoitenga, party official Ormand Hook, and Morris Langworthy, who came close in 2010 and 2004, are running. (R) (Likely Rendon) Daire Rendon (E/RTL), wife of the incumbent, faces self-funding doctor Vijay Kumar, who has been charged with sexual abuse. (R) (Likely Inman) Inman (E) won the Republican primary in 2014 with 21%. He is being challenged by former county commissioner Jason Gillman (AC). (R) (Tossup) Cheboygan County Commissioner Sue Allor, David Chandler, Chamber of Commerce official Jackie Krawczak, and Benishek staffer Jesse Osmer are running. (R) (Likely Chatfield) Lee Chatfield (C/E) defeated incumbent moderate Republican Frank Foster in the 2014 primary. Supporters of Foster are backing Sioux Ste Marie City Commissioner Kathy Twardy this year. (R) Veteran Alan Arcand (AC), Beau LaFave, and Darryl Shann are running. (D) Kivela was arrested for ‘super drunk’ driving last year. He is being challenged by Marquette City Commissioner Sara Cambensy. In re 104, Gillman was endorsed by the NRA. Inman also has a 'C' rating with them. For those where the 2nd Amendment is a significant factor in selecting a candidate, I'd say Gillman has that one pretty well locked up. Correction: Kathy Twardy (107), of Chippewa County, is a Sault Ste. Marie City Commissioner. Godspeed on the election, Jason!